XT is a Swedish Metal band that was formed back in 1991 by both Björn Stigsson(Leviticus) and Sonny Larsson(Motherlode/Charizma). The meaning behind the band's name is that XT is simply an acronym for Christ. After having been founded, the band quickly took to the studio to produce their debut self-titled album which was released in 1992 on Viva Records. Band members for their debut were Vocalist-Sonny Larsson, Guitarist-Björn Stigsson, Bassist-Håkan Andersson, Backing Vocalist-Petra Stigsson, Drummer-Michael Ulfsgärd. Just a year later, in 1993 XT released their sophomore follow-up album which was also released on Viva Records and smartly titled 'Taxfree'. It's worth noting that track 6 - ”The Silent Cry” from Taxfree was awarded as the most powerful song of the year by Aftonbladet, Sweden’s biggest evening newspaper with 3.5 million readers. Band members for 'Taxfree' were Vocalist-Sonny Larsson, Guitarist-Bjorn Stigsson, Keyboardist-Niklas Johnsson, Bassist-P-O Larsson, Drummer-Mick Nordstrom. To the delight of their fans, two years later in 1995 the band delivered up their third full-length offering titled 'Extended Empire'. Extended Empire was released on Viva Records and is a harder hitting album than their previous two releases allowing XT to step up into the Metal realm. Band members for 'Extended Empire' were Vocalist-Sonny Larsson, Guitarist-Bjorn Stigsson, Keyboardist-Niklas Johnsson, Bassist-Johan Stark, Drummer-Kjell Andersson. By the end of 1995 XT played their last gig and stepped off the stage taking a 22 year hiatus from the music scene. However, in the Spring of 2017, to the delight of their fans around the world, the band announced their return to the Heavy Metal scene. In 2017 XT reunited to release their fourth studio full-length album titled 'Saved By The Blood'. With this release we find the band has changed labels and is now with 'Talking Music'. We also find a band that is comprised of an all-star lineup with Vocalist-Sonny Larsson formerly having been with(Motherlode/Charizma), Guitarist-Björn Stigsson formerly with the band-(Leviticus), Bassist-Peter Carlsohn having formerly played in the band-(Jerusalem), Keyboardist-Dan Tibell also formerly with-(Jerusalem), and Drummer-Mick Nordström who was formerly with the band-(Modest Attraction). 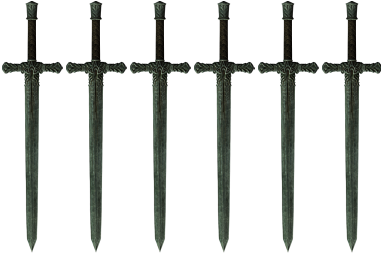 ​ Saved By The Blood is a partial concept album as tracks 6, 7, and 8 follow a story line as seen in the bible with Track 6 covering "The Last Supper", Track 7 covering "The Crucifixion" , and track 8 covering "The Resurrection". You might wonder how this release is considered a full-length album with only 8 tracks present. Well most tracks are in the 4 to 5 min range while there is track 1 that is 6 min long and track 7 that's and incredible 12 min 39 secs which places the album's total running time a little over 45 minutes long. 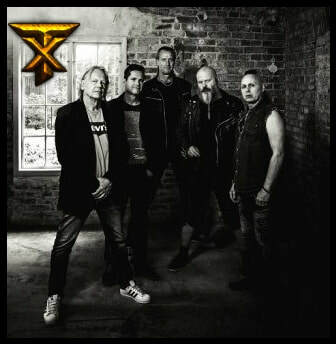 XT isn't the first to come out of retirement because in the past few years we have seen several other bands from the 80's/90's releasing new material with their vocalists delivering up strong performances like Les Carlson(Bloodgood), Rey Parra(Sacred Warrior/Worldview), and even Michael Sweet(Stryper). With this release, Sonny Larsson captures that nostalgic Metal vibe from the 80's golden years. It's probably best said that Sonny's Vocals just keeps getting better with age. If I had to compare Larsson to another vocalist I would have to say that he's not unlike Vocalist-Frank Breuninger(Dark Sky). There's a subtle eerie dark undertone to Larsson's delivery that captures ones attention and helps put this project up there with some of the better releases that we have seen this year. ​ Björn Stigsson, having cut his teeth with the band Leviticus along with several of his own projects, lays down the shred for the band reminding us what a six string axe can do. Here we find everything from heavy riffs to 80's style blues play in the veins of Glenn Kaiser(Rez/Resurrection Band).